Successfully Added VKWorld T6 Smartphone - 6 Inch Screen, 4G, Dual SIM, Android 5.1, Smart Wake, Gesture Sensing, 2GB RAM + 16GB Memory (Gold) to your Shopping Cart. The VKWorld T6 Android smartphone sports a nice 6 inch display, ready to show all your media in HD. With 4G support, you will also be able to do loads of web-browsing on the go, quickly download needed files or apps from the Play Store or upload to social media, the pics you took with one of the phone’s cameras. With two SIM cards, you can conveniently keep work and social life apart with two mobile accounts on one device. Smart Wake will let you get instant access to some of the most frequently used apps right from the locked screen. And with Gesture Sensing you will be able to skip music tracks (and more) with a simple wave of the hand. Powered by the MTK6735P Quad Core CPU and featuring 2GB of RAM, the smartphone offers smooth operation and multitasking. You will have plenty of storage space with its 16GB internally and the support of 64GB on an SD card. The VKWorld T6 comes with a powerful LED flashlight — a great help in emergencies, black outs or when fumbling for keys in the dark. The cell phone also comes with Hot Knot support. The feature, quite similar to NFC, allows for quick file transfers between supported devices. Unlike with NFC, though, you will need to touch the phones together screen to screen instead of back to back. 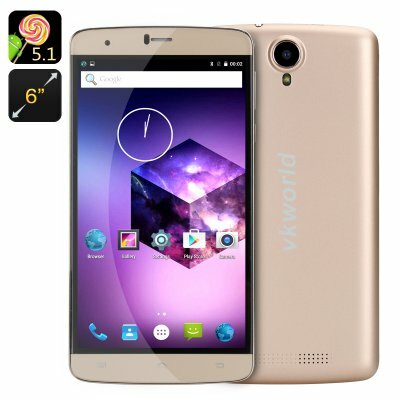 The VK World T6 Smartphone comes with a 12 months warranty, brought to you by the leader in electronic devices as well as wholesale Android Phones..